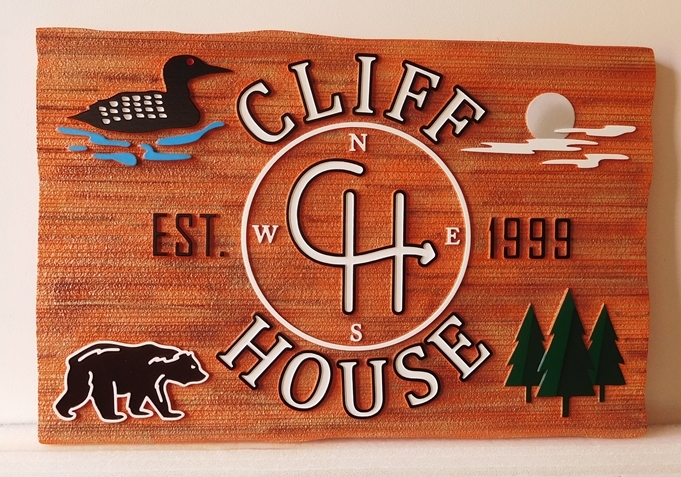 This carved "Cliff House" sign is made of High-Density-Urethane. The background is sandblasted in a wood grain pattern and is then painted with an airbrush to give a rustic wood appearance. The text and artwork are raised above the background at two levels. The artwork features a bear, a duck, pine trees and the moon. This outdoor sign is clear-coated twice as extra protection against UV radiation and rain and snow.The sign can be mounted on a wall or fence, on a post or between two posts, or hung from a wood or iron hanger from the eye-hooks on the top.